The building on the right with the hole in it is the Shanghai World Financial Center, and it was the tallest building in China (and second tallest in the world) until the Shanghai Tower came along to leave it in the shadows. 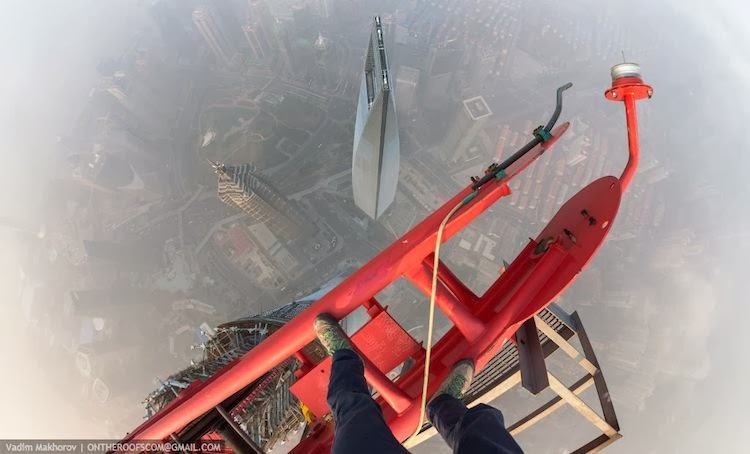 During Chinese New Year, everything shuts down, including the construction of the Shanghai Tower, which usually goes on round the clock. So it was easy for these two lunatics to climb a fence and gain access - there was no one around. I got to about 1:43 and I couldn't watch anymore. Crazy guys!! But what a beautiful view.